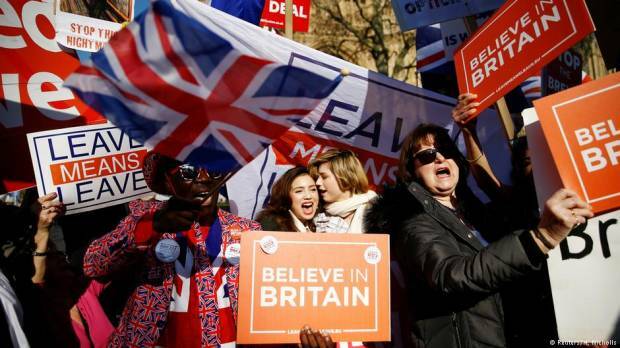 Lawmakers in the House of Commons overwhelmingly backed a government motion on Thursday to ask for a three month delay Brexit, which is currently scheduled for March 29. The vote comes after a week of defeats for Prime Minister Theresa May, which saw her Brexit deal with the EU rejected for a second time on Tuesday, as well as a vote on Wednesday which saw lawmakers reject a no-deal Brexit under any circumstances. With a vote of 412 to 202, lawmakers overwhelmingly backed the government’s motion to ask the EU to push the divorce date back to June 30. The government’s motion states that it would ask for the three-month delay — but on the condition that Parliament approves May’s withdrawal agreement with the EU. Lawmakers also overwhelmingly voted down the prospect of a second referendum — with only 85 MPs backing the amendment, while 334 voted against it. An amendment that would have given lawmakers more control over the Brexit procress narrowly lost, with 312 voting in favor and 314 against. An amendment to block May from bringing her divorce deal back for a third vote was withdrawn. Where does the EU stand? Even if British lawmakers vote to support extending the Brexit deadline past March 29, it’s not certain that the EU would grant it. EU leaders have expressed frustration at the political turbulence taking place in London, saying that they would grant an extension but would need a concrete reason from the UK for doing so. Any delay would require unanimous approval from the leaders of the remaining 27 member states.